The empanada fiesta takes place annually on the last Sunday in August which always coincides with the Fiesta de San Bartolomeu. In this year, 2005, that meant the final day of the main festival on August 28. The empanda is a large circular or rectangular pie with a variety of different fillings based on meat or seafood and flavoured with paprika and onion. The festival is a celebration of this Galician specialty. 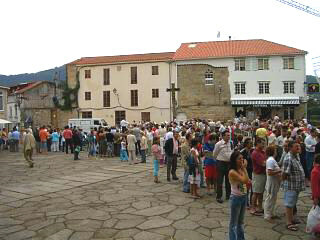 Below, queuing for a slice of empanada. 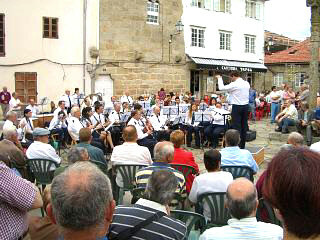 The empanada festival takes place at the "Tapal" square, which sits in front of Noia’s impressive "San Martino" church and has a brass band playing for most of the duration of the event. In the lead up to this festival we were sat talking on the far side of the river and we were continually distracted by a spasmodic procession of ladies, each carrying several empanadas to the "Tapal" square. At 1.30pm, when the festival was due to start, we made our way over to the "Tapal" piazza, only to find it packed with early arrivals already queuing for their piece of empanada. Below, the empanadas to the right are being dished out by the ladies to the left. The way it works is simple. You join a typically disordered Spanish queue and then pay three euros per head to get a voucher that entitles you to a slice of empanda and either, a glass of red or white wine, or a bottle of water. The choices of empanada (as far as we could tell) were as follows – pork, veal, cod or shellfish. (There is no such thing as a vegetable empanda.) An observation we made was that the fish and seafood pies tend to be square whilst the meat based ones are round. We were told that this is traditional. Maria opted for the Pork whilst I (as in the past) selected the shellfish and we each went for a glass of red wine. The amount you get is certainly sufficient for a lunch and you can of course return and pay for a second helping. 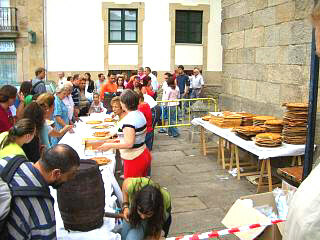 The festival of the empanada is certainly one of the highlights of the fiestas week in Noia. Well over an hour after it started, people were still arriving and queuing and fresh empanadas were still being delivered. Even when we departed, almost two hours later, there were still piles of pies awaiting sampling and the tasters were still plentiful. The whole experience was also enhanced by the weather which was hot and sunny and the setting with a back drop of an eight hundred year old church. The empanada fiesta is one of the few which really has been left unchanged by the onset of time and its makes a great climax to Noia’s wider festival of Saint Bartolomeu. Above, the brass band that provided some musical accompaniment.